A Sneak Peek at Springfield Armory’s New Defensive Pistol? What could this new pistol be from Springfield Armory? Just today Springfield Armory announced a completely new pistol from the Geneseo, Illinois-based gun manufacturer. In a teaser video (video below) they show it being put through some drills and paces, but the gun itself is not being released to the world until later this week at the 2017 NRA Annual Meetings and Exhibits in Atlanta, GA. In fact, in the teaser video, they have blurred any evidence of the gun, so we don't get any idea as to what it might be…until the very end where there's two very quick frames that seem to show a handgun that doesn't quite match up with anything in their current lineup of products. I managed to freeze the frame right at the precise moment, and the result is the blurry image in the header of this article. From what we can see, it appears to be a striker-fired, compact, full-length dust cover frame, semi-auto. 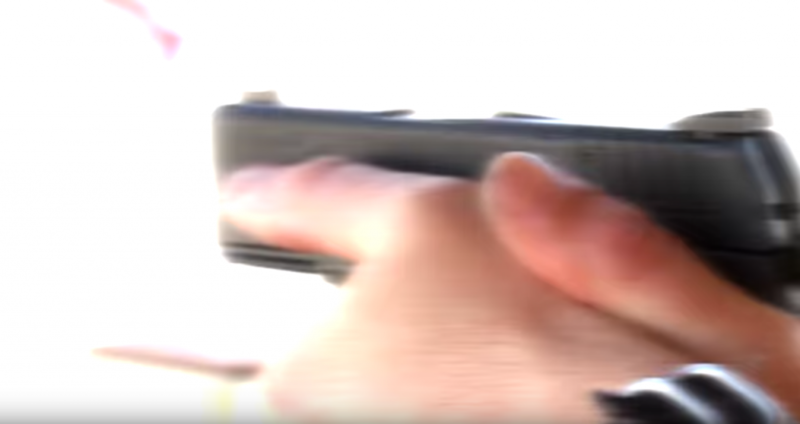 It's definitely not an XD-based pistol, at least as far as the slide is concerned. This new one appears to have a slide that is sloped at the rear. So it is either something completely new, or if it is related to the XD lines of pistols, it's going to have a slightly different shape. Many people are wondering if it might be the first pistol from Springfield that doesn't incorporate a grip safety. There are many gun owners that do not like grip safeties. It is viewed as another mechanical part than can fail. Some see it as an opportunity for your gun to fail to fire because you failed to get an adequate grip on it to disengage the grip safety. I'll grant you those arguments, but I personally have owned several Springfield Armory XD and XDm pistols; have fired many thousands of rounds through them; have abused them in all sorts of nasty, dirty environments; but I have never had a problem with one. I do not have a problem with using any of their guns for self-defense or using them in the highest levels of competition shooting. Regardless, I wouldn't get my hopes up too much about them abandoning the grip safeties. At least if they do, that really would be a surprise announcement later this week. My prediction: a single stack, defensive pistol, striker-fired, probably 8-10 rounds, 9mm, sized somewhere between the XD-S pistols and the double stack full-sized pistols. Oh, and I think it's going to be made in America! Stay tuned, I will be there first thing Friday morning at the NRA Annual Meetings & Exhibits to personally lay eyes and hands on it, and we'll see just what it is that Springfield Armory has spent the last 2 years behind closed doors working on. 9 Responses to A Sneak Peek at Springfield Armory’s New Defensive Pistol? Bill, Springfield Armory is indeed working on a 10mm version of the XDm pistol. They say sometime in 2017, but I have not seen anything definitive on that timeline. What I do know about this new pistol they are releasing to the world later this week is that it is not that…a 10mm XDm. I am confident they would not release a completely new pistol design and start off by offering it in 10mm. The safer bet would be 9mm, or perhaps 45acp. They said they’ve been working on it for 2 years–top secret. That suggests to me that it is a completely new design. They could relatively easily redesign the existing 45acp XDm frame and slide to handle the 10mm. No biggie there. As to why they haven’t done that already…simple…priorities. Thanks for reading, and stay tuned! They will be one of my first stops on Friday morning, and I will report my findings as soon as possible! It’s not a bee fired it’s a hammer I paused it at perfect time and seen the hammer. I tend to agree. Looks like a hammer to me, too. Time will tell, and we’ll let you know as soon as we can! My wife just bought an XD Subcompact Mod 2 in .40 Cal. I don’t think it is a 9mm or striker. look at the mags on the shooting bench. They look like large double stacks and the ammo on the bench in the plastic tub looks like 10mm. The last frame after the picture of the pistol on this site shows what looks like a hammer that is cocked. There is a spec sheet on one of the tables with a picture of a pistol. Looks like a double/single action trigger. So I obviously retracted my “prediction” or at least parts of it. When I first got access to the teaser video, I couldn’t seem to quite catch that final frame, so I couldn’t see the hammer. I could only see the image that is in the header of this article where there is no sign of a hammer. But clearly this will be hammer-fired. The ammo on the table, by the way, is Federal Syntech. They don’t make an 10mm ammo in the Syntech line. Plus it would be stupid for Springfield to release a completely new product first in 10mm where only maybe 2-3% of gun owners (and probably less) even own or care to own a 10mm. Springfield has stated they are working on a 10mm, but I’m sure it will be in the XD or XDm line of pistols. The ammo on the bench looks like 9mm ammo to me. Thanks so much for reading and for your comments. I am SUPER excited to go see this thing tomorrow morning!